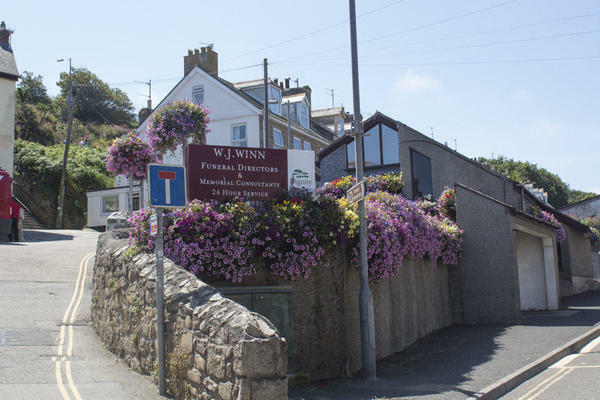 W J Winn Funeral Directors in St Ives offers sympathetic funeral services to the local community and those from the surrounding areas in Cornwall. Please get in touch to arrange a professional and dignified send off for your loved one. As we are here to help you through this difficult time, you can always be sure of a friendly and sympathetic welcome from our Cornish funeral directors. Our guiding hand will see you through the arrangement process, as well as help to dispel any doubts or uncertainty you may be experiencing. We can tailor your loved one’s funeral to meet your own preferences, whether it is for a religious, non-religious, traditional or a contemporary ceremony, and we will make it as personal or as unique as you want it to be. The name of W J Winn has been associated with funerals in this part of Cornwall since the founding of our first funeral home in 1978. The St Ives funeral home was established in 1985. Our roots within the community remain strong and one of our funeral directors, Suzanne Tanner, is the current Town Mayor of St Ives. Our location on Trenwith Terrace makes us easily accessible to all parts of the town and we regularly arrange heartfelt farewells to the loved ones of families from villages and hamlets further afield, including Carbis Bay, Canon’s Town, Lelant, Nancledra and Rose-an-Grouse. We are available to talk 24 hours of the day. To speak with one of caring and compassionate team, call us today. Call us today on 01736 793029 to talk through your personal requirements. There is car parking available at our branch, and there is a pay & display car park on the opposite side of the road by the launderette. We are located just down from the Stennack Surgery, St Ives, on the opposite side of the road. Our staff are available 24 hours a day on 01736 793029 if you require our services outside of these hours.